New tasks can be created in the Manage Job Details dialog by clicking . A new row will be added to the task list where you can enter the necessary data. It is important to use a uniqe task number. Specify the predecessor of a task by referencing to its task number. You can select a resource, but it is not a must. However, you must define a resource group that is responsible for working on this tasks. Please note that all task-relevant details can be entered here. 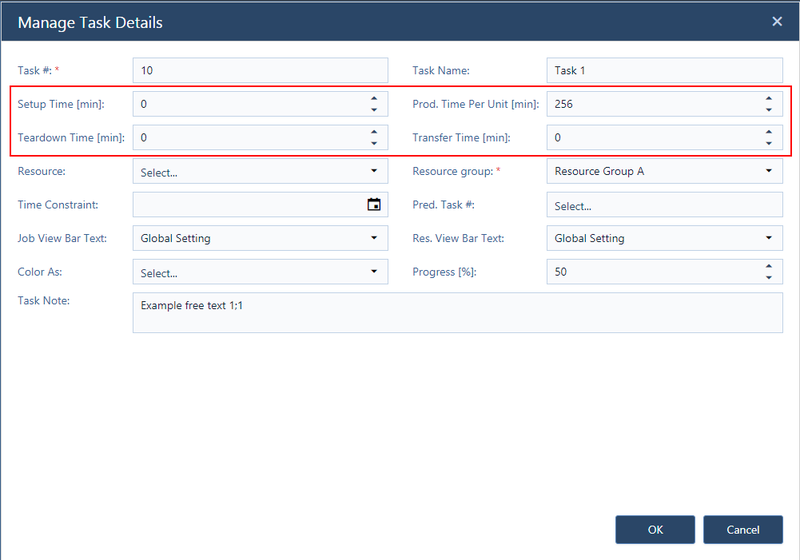 For specifying further and more indvidual details, use the "Manage Task Details" dialog where you can view and edit all task details as described below. 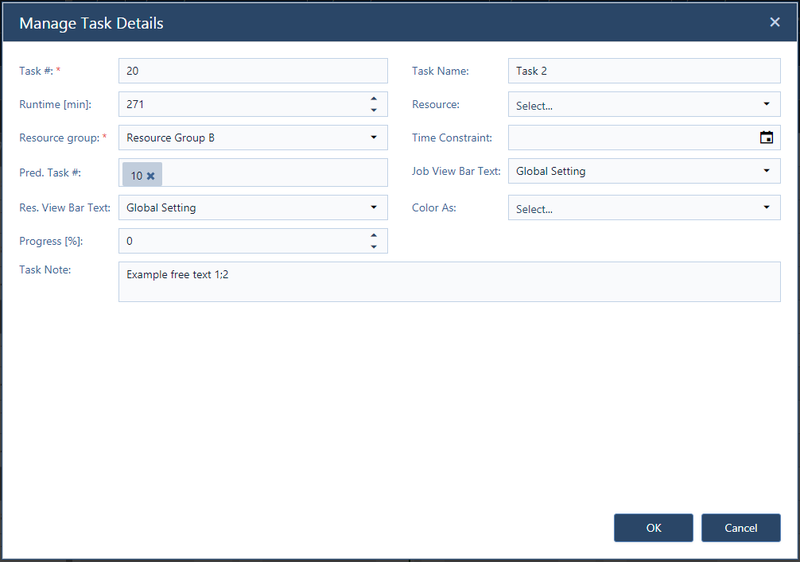 In addition to creating tasks, the Manage Job Details dialog can also be used to edit task details. It can be reached either from the Manage Jobs dialog, or by clicking in the job line. In the lower part of the dialog, all tasks of the job are listed. New tasks can be added, existing tasks can be edited and deleted. Please note that you can specify further, more user-specific task-related details in the Manage Task Details dialog. A divider between the job-related information and the tasks list can get moved up and down to enhance or enlarge the space for either area, whereas the horizontal scroll bar lets you view and edit all details. In either case, the following dialog appears and you can enter or modify the task details. Basically, creating and editing tasks in the ENTERPRISE edition is done the same way as described for the BASIC and PRO edition with one fundamental difference allowing for a more refined scheduling.